Gamblin FastMatte Alkyd Oil Colors were formulated to offer painters an artists' grade oil color that dries quickly, yet offers the adhesion of a ground, making it excellent as a base layer or for underpainting techniques. FastMatte's alkyd resin-based binder allows it to dry more quickly naturally, creating a receptive, matte surface for subsequent layers. All colors except Titanium White and Cadmium colors are transparent or semi-transparent in nature, creating the tonal range so important for underpainting techniques. When applied in thinly painted layers, FastMatte dries in approximately 18 hours. This drying rate allows painters to work throughout a painting session without the oil paints drying on the palette, while at the same time creating a dry surface for the next painting session. 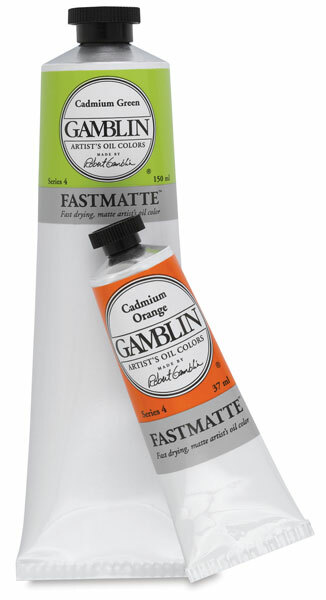 To make FastMatte more fluid for underpainting techniques, thin it with a 50/50 mixture of Gamblin Galkyd Painting Medium and Gamblin Gamsol Odorless Mineral Spirits. Moderate use of this mixture ensures the adhesion of thinner paint applications while maintaining the matte surface quality. For a gloss surface, apply a thin glaze or a coat of Gamblin Gamvar Picture Varnish. The fast drying rate of FastMatte Alkyd Oil Colors makes it well-suited for plein air painters, especially while traveling and transporting freshly painted works. Gamblin FastMatte Alkyd Oils are completely compatible with other artists' grade oil colors, and speed up their drying time based on the proportion used. FastMatte is also compatible with Gamblin's alkyd-based Galkyd painting mediums. Use with these mediums, however, increases the gloss level of the FastMatte Colors. Introductory Set — This set contains eight 37 ml FastMatte colors, a 37 ml tube of Solvent-Free Gel, and a pre-primed, cradled 6½" × 12" painting panel handcrafted in North America from sustainably forested birch. The colors include Cadmium Yellow Light, Cadmium Red Light, Alizarin Permanent, Ultramarine Blue, Phthalo Green, Yellow Ochre, Chromatic Black, and Titanium White.